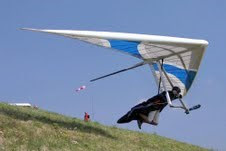 Rich Lovelace ~ hang gliding: Striking for Safety - same could be said of Sprogs? Striking for Safety - same could be said of Sprogs? So, do ‘we’ really want a 'company' telling us what we can and can't do - paying the extra money in competitions to have people measure our gliders and say "you are .2 of a degree out, you're dsq'd today"? At the moment it seems only the main comps ie the Worlds and Europeans which are affected but for sure if the DHV get its foot in the door which it seems it is trying to do in what I feel the wrong way then maybe our competitions will be very poorly attended, if attended at all. I feel it is the pilots responsibility and with the correct education I am sure we will not have the stupidity like we've had in the past of pilots having ridiculously low sprogs. I feel a good percentage of the accidents certainly that I have witnessed in competitions are due to conditions that we fly in (not just sprogs) and yes I know people can say "you don't have to fly if you don't want to fly" and that's fair enough if you are at the end of the field but if you are leading or at the top of the field and have spent a lot of money/time/commitment in getting there you are not going to be sat on the hill - that is what a competitive nature is all about!